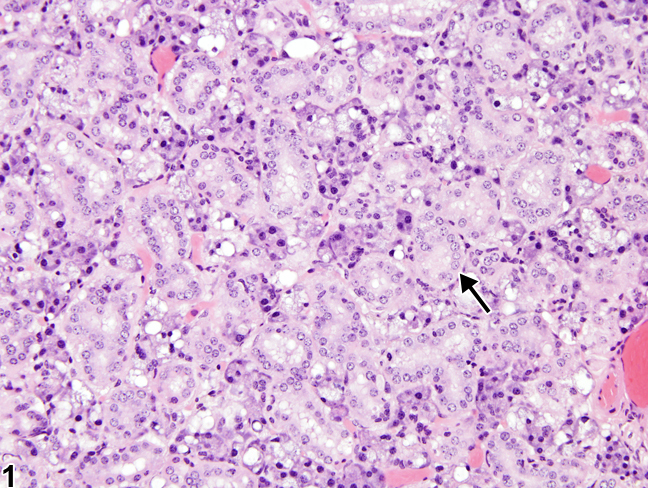 Normal submandibular salivary gland in a female B6C3F1 mouse from a chronic study. 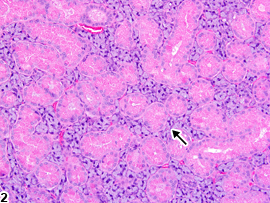 The arrow indicates a convoluted salivary gland duct. 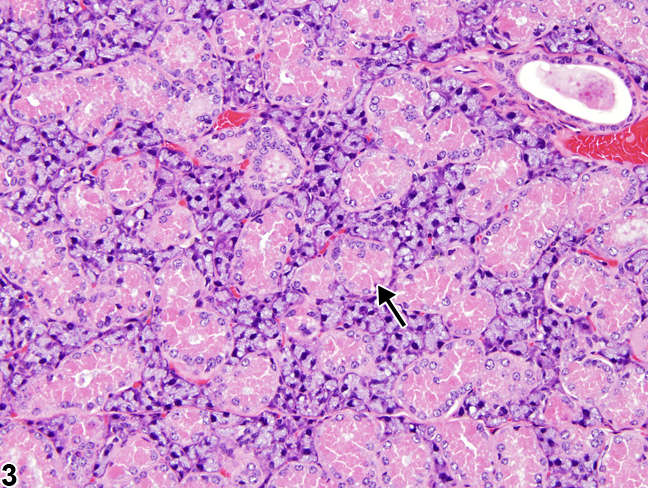 Normal submandibular salivary gland in a male B6C3F1 mouse from a chronic study. 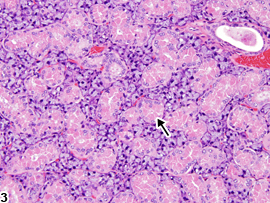 The convoluted salivary gland ducts (arrow) contain more eosinophilic, cytoplasmic granules in males than in females (see Figure 1). Salivary gland, Duct - Cytoplasmic alteration in a female B6C3F1 mouse from a chronic study. 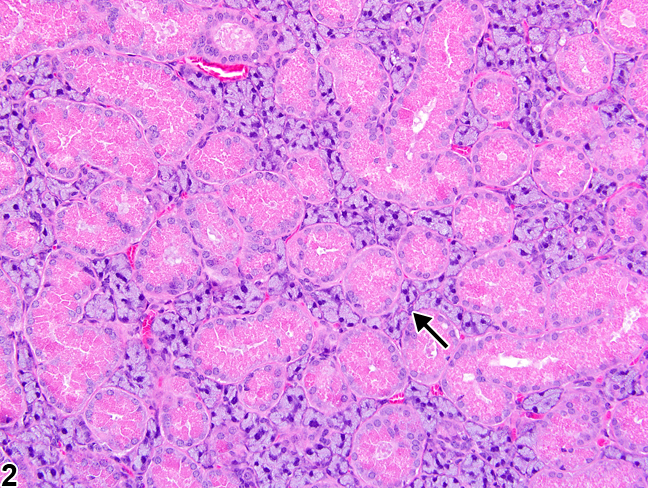 In this submandibular salivary gland, there are increased numbers of eosinophilic, cytoplasmic granules in the ducts (arrow), reminiscent of the male ducts. For a discussion on the sexual dimorphism of the salivary gland in rodents, please see the Introduction for this chapter. Examples of the normal female ( Figure 1 ) and male ( Figure 2 ) salivary gland ducts are provided here for comparison. In females, cytoplasmic alteration of the submandibular salivary gland is characterized by an increase in granularity of the convoluted (granular) ducts ( Figure 3 ), such that it appears similar to the normal male salivary gland ducts ( Figure 2 ). This change is due to a masculinizing effect of certain chemicals or hormones. 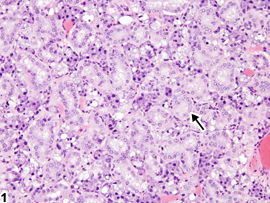 A concomitant metaplasia of the parietal epithelium of Bowman’s capsule in the kidneys from flattened to cuboidal can also occur in the female mouse when exposed to masculinizing agents. Cytoplasmic alteration is often a subtle change requiring careful scrutiny. Cytoplasmic alteration should be diagnosed and graded based on the degree of increase in eosinophilic intracytoplasmic granules and number of convoluted (granular) ducts affected. Seely JC. 1999. Kidney. In: Pathology of the Mouse (Maronpot RR, ed). Cache River Press, St Louis, MO, 207-234.